Los Angeles, CA, August 24, 2018—Greenland Holdings Group, parent company of Greenland USA, recently hosted a group of students from Los Angeles’ Alexander Hamilton High School Jazz during their stay in Shanghai, as part of a larger cultural exchange trip to China. The program is part of a sister cities partnership between L.A. and Chengdu, and was sponsored by the Chengdu City government, the Chinese General Chamber of Commerce-Los Angeles (CGCC-Los Angeles) and a selection of Chinese companies in the U.S., including Greenland USA. 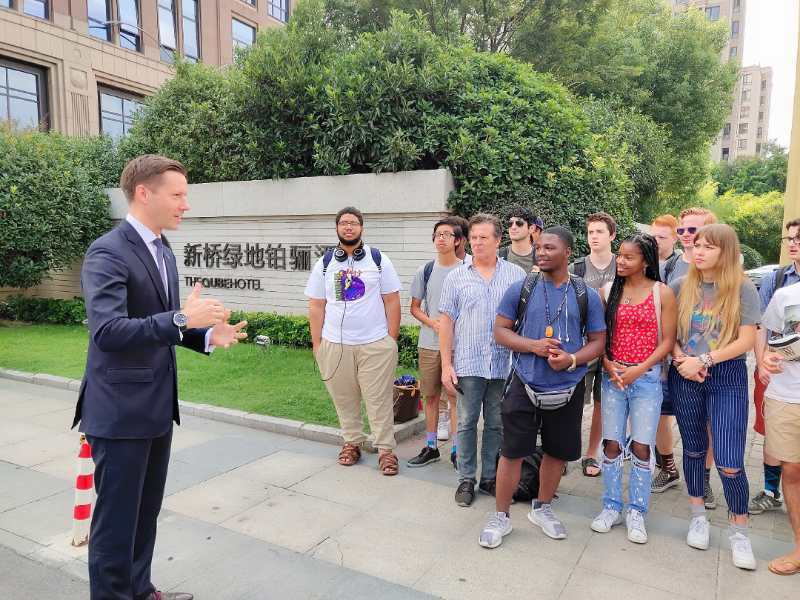 During their trip to China as cultural ambassadors for Los Angeles, the students visited Shanghai, one of the country’s biggest metropolises where Greenland Holdings Group hosted the students for three days at the company’s Qube Hotel, Xinqiao. “We are proud to have been part of this cultural exchange program, which we believe contributed to an exchange of ideas between the U.S. and China, and enabled students to broaden their horizons and understand one of the biggest and most vibrant economies in the world,” said Zhou Tian, Senior Vice President and director of Human Resources and the Executive Office, of Greenland USA. In Shanghai, the students visited Greenland’s Hongqiao World Center where Greenland’s Smart Office and Command Center of the 1st China International Import Expo are located. The Expo will be held from Nov. 5-10 this year. They also explored cultural sites such as the Duo Yun Xuan Art Center, well-known for Chinese woodblock printing art. Back in Los Angeles, the students attended a reception at the Chinese Consul General’s residence in Los Angeles where they said they were inspired by their experience in China and were impressed by the generosity and hospitality of Chinese people.